Ghost ants are very common in our neck of the woods. They can be recognized as the tiny, almost clear or see-through ants measuring around 1/16 of an inch in length. They are very small in size, with a dark head and thorax, and light colored legs. These ants are tough to see sometimes, giving them their name as ghost-like, sneaky pests. Ghost ants remain active year around, thriving in the South Florida client. These ants can become a real nuisance for any home or business owner as they are found prevalent in most areas. They are attracted to sugary, sweet foods and will seek out any leftover crumbs or spillage in a pantry or kitchen. They can be found in bathrooms as well, as they are attracted to the water source and find food in spilled toothpaste and other sweet substances. These ants are not dangerous to humans, as they are very, very small in size and aren’t known to bite. Ghost ants can be found moving in small lines along the outside of homes, buildings, and structures foraging for food and water sources. They are commonly found nesting in wall voids and through small cracks and crevices. Treatment for this type of ant normally requires baiting, as well as a spot, crack, and crevice treatment along the perimeter of the home or business. Many times these ants can be found crawling onto the structure from trees or shrubs hanging onto the structure itself. The big-headed ant is another common ant seen in most areas of Florida. They are a very small ant, measuring about an eighth of an inch in length for minor working ants, and about a quarter of an inch in length for the bigger worker ants. These worker bigheaded ants have a disproportionately-sized head that is much bigger than their body, which is how they get their name. These ants are typically active for the majority of the year, and can be found in ornamentals and shrubbery as well as in the soil and plant beds around the perimeter of a home or business. They can be found near cement structures, and sometimes will make their way in through the foundation of the home and through building nests outdoors along the edges of the property and working their way inside. They form trails outside in the form of mud tubes that resemble termite mud tubes. Many times, you will notice a black pile with ants trailing around it along baseboards inside the home as well. The big-headed ant can be a nuisance in the yard and from time to time even in the home or business. They require additional treatment for control in flower beds, bushes, and inside the home, yet the control of this species of ant is attainable. Carpenter ants are larger ants, about a ½ inch in length. They have a body red in color with a black section towards the front of the body. They can be found year-round, with colonizing carpenter ants growing wings and “swarming” in the springtime. Often times mistaken for termites, these ants find themselves in areas of damaged wood quite often, as they utilize wood for nesting purposes. feeding on honeydew and the insects attracted to it as well. Due to their affiliation with wooden structures, they can be rather destructive, prompting quick and immediate treatment if found in and around the property. They require additional treatment for control and elimination. Further information can be provided by reaching out to the professionals at Advantage for help! The Caribbean Crazy Ant are another common ant found in most areas of sSouthern Florida. They are a reddish-brown ant with a hint of gold. Their name derives from their “crazy” nature as they are very fast moving ants, moving around quickly and erratically. This species is believed to have come over via cargo ships in recent years, as they are relatively new to the state of Florida in comparison to other species of ant. CCA’s travel in large colonies and it is not uncommon to see dozens at a time. These ants require additional treatment for control and elimination. The white-footed ant is a relatively common ant found in our area on a regular basis. These ants are small (about an eighth of an inch in length), with black bodies and white/yellow feet, hence their name. This species of ant feed on honeydew and sugary secretions of the many ornamentals found in our area. They do not cause structural damage. They are commonly seen crawling from the shrubbery onto sections of the home or building, making their way towards the rooftop or attic space as they seek to nest above ground-level. Many times the white-footed ant can become a real headache for business and homeowners, as they create their immensely-populated nests in the attic space and are seen dead on the ground as the winged swarmer ants fly out from the colony. These ants are commonly found in bathroom, kitchen, and areas throughout the house foraging or in this fashion. 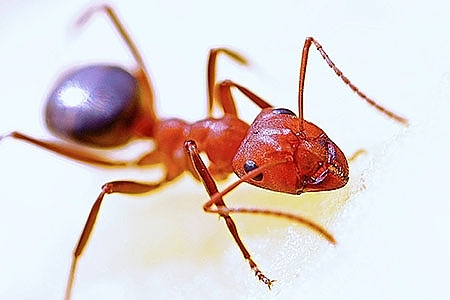 Treatment for the control and elimination of these nuisance ants usually requires extensive attic dusting (if colony is found in attic space) and treatment along the ornamentals where the white-footed ants are coming from as well. For ant problems you may be experiencing, it helps to get the proper knowledge directly from the pros. Each species of ant is different and may require different methods of treatment. Contact Advantage for professional help in the identification and treatment of ants of all shapes and sizes.